It’s no longer mine. My trust steed. 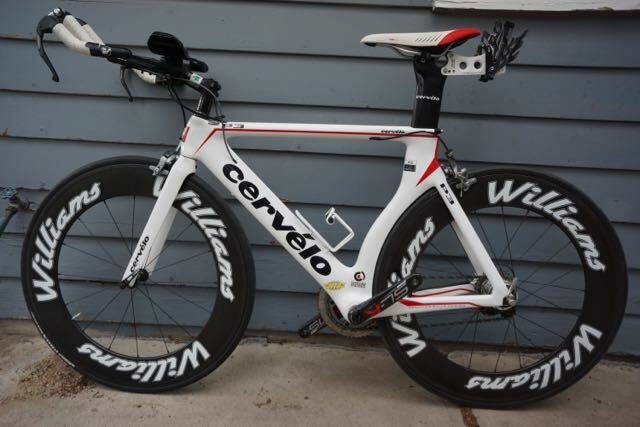 The Cervelo Triathlon bike I rode for a year and then put into storage. That year was 2011 and now it’s 2015. Why have I hung on to it for this long? I’ve identified myself as a Triathlete for a long time, since I was 16 years old and did my first one. I love the sport and have made some of my best friends through it. Something about training, racing and suffering together serves well to bring people together. If you have followed this blog for the past few years you know that my life has taken a few dramatic turns. I’m happily married. I’m no longer racing triathlons (my last one was in 2011). I am no longer employed by Microsoft or anyone other than myself for that matter. I’ve downsized my lifestyle. I’ve spent almost 18 months living out of a backpack (or the back of a Subaru Outback) while traveling the world with my wife. As part of this journey I’ve confronted myself with hard decisions many times. To let go of things that don’t bring happiness and fight for things that do. Declutter isn’t the best word, but it fits. Declutter the ego to make space for life. My triathlon bike isn’t a big deal in the grand scheme of things. It’s just a bike after all. To me there a lot of emotions and other things attached to it. I’ve resisted letting it go. I’ve sold my car, and given away countless boxes of clothes, piles of electronics and a truckload of furniture. The bike is different. My (former) Triathlon Bike. It served me well, now it will serve someone else even better. I tell myself I might want to race triathlons some day. I tell myself the $7,000 I put into it would never be recoverable in a sale, so I should keep it. I tell myself to just keep it in the corner of my small home as a reminder of who I was or could be. I’ve realized that to me, the payoff of thinking in this way has been one of serving my own ego. I like the pride of calling myself an Ironman Triathlete, so I keep the bike around, despite my lack of desire to do such races any more. It’s an ego trip plain and simple. I’ve also realized that there is some fear wrapped up in this bike. Fear that without a steady paycheck, keeping the bike around is like having a few thousand bucks tucked under a mattress. Perhaps I could sell it someday if I really needed the money? This makes no sense, the bike is a depreciating asset! I’ve got enough money saved to live a happy life. My new business is building up. I really have no financial worries. Emotions are non-sensical. Logic is no match for them. In the end, I’ve gotten over it. I’ve realized that letting go of the bike means someone else can enjoy it. I can shed the old story of “Ravi the Ironman Triathlete” and write a new and more empowering one. I can use the money I will get from selling it for a better purpose. The eBay auction closed last night. A winner was announced. Someone in Texas will be enjoying my tricked out Cervelo P3 with racing wheels and power-meter. I’m sure he will set a PR this season. I will be enjoying an extra $3,000 and a little lighter space in my ego as a result. I think that is a fair trade. I’ve been unconsciously delaying getting ride of that bike. Shipped it out yesterday and feel much better already!